I fancy myself as MBW, Mountain Border Woman, because I live in North Carolina close to the Tennessee border in a cabin about the size of a boxcar on the side of Hap Mountain. I am almost eye-level with Max Patch, a natural bald mountain almost over 5,000 feet in elevation and at least an hour from the nearest grocery store. You might think it is totally wild for a single woman in her seventies to be living in such a remote spot. But I am part of a community of meditators only one third of a mile from Southern Dharma Retreat Center where experienced Buddhist teachers come to give workshops to students from all over the United States. I was in Billings, Montana and planning to take the easy way to visit my stepson. I called and told him I was by the Yellowstone River in a KOA Campground and would be heading his way via the interstate the next morning. “Be sure you don’t miss one of the best drives in America,he said. This suggestion was coming from an outdoor enthusiast rather like Ernest Hemingway, who had probably hiked, biked and rock-climbed his way over the same route. I had just come from the bucking bronco state of Wyoming and turtles don’t backtrack well. But having the worlds best and drive together in one sentence is to the RV- trekker like finding gold was to the Conquistadors. What was one hundred miles when I had just traveled a couple of thousand in a month’s time in a relic of a motorhome I call The Turtle? I opened my road atlas and noticed that the best drive in America was about the same mileage as the boring and fairly flat interstate. I skipped over the part where my friend who was helping me plan the trip wrote in red, The Alps. I am sure when I put the Rand McNally on her seat.The Turtle saw the parts I missed like, Windy Mountain, 10,262 feet; The Thunderer, 10,554 and the very first mountain to cross, Beartooth Pass, Elevation 10,947. She might have thought it was too much of a feat for her overloaded four cylinder heart. I stopped at a rest stop down the road. The sun was peeping behind shadow clouds, wheat grass was swaying, and in the distance were mountains making me feel calm and intrigued. The words of John Steinbeck flashed in my mind: “Montana is a great splash of grandeur.” I was ready to take the plunge and excitedly turned the key. Click, Click was the only sound I heard. She wouldn’t start. I pulled the manual choke, pushed on the gas pedal and tried again. She was silent. I cranked several times and was getting crankier by the minute. The Turtle was not in the mood to go anywhere. I knew if I waited a bit, The Turtle might stop her mulish ways. She had pulled that trick of making me think of tow trucks many times before. But then she is a hundred years old in truck time and I was not sure she would start. But to be sure, I had everything there: a place to nap on her over the cab double bed or on her blue dotted sofa cushions. I had ramen noodles, shrimp flavor, boiling on her three burner gas stove and plucked an apple from her thirty year old fridge. After lunch and a nap, I tried the Turtle again and she started reluctantly. I knew I was headed into the Absaroka Wilderness where there was no cell phone service. But I only had a few miles to go before I reached my camping spot in the Custer National Forest. We camped by a wild and woolly stream that drowned out the noise from the generator. I built a charcoal fire while keeping my eye out for grizzly bears. My only plan of protection was blowing a big red whistle that was so loud the Russians on the space station could hear it. I turned the generator on the next morning to get the fridge cold again, to start my coffee pot, and to play my radio. I was so far down in the holler that all I heard was static. I ate my favorite breakfast, two eggs over easy without bacon because I was in bear territory and I did not want tantalizing smells as torn turtles are a ragged sight. With my two hour generator running time over, The Turtle and I were ready to race to glory. I hung my fierce whistle around my sweaty neck and prayed the choke would awake the Turtle from her night dreams of swimming in a placid pond. Lo and behold she started like the champ she truly is. And we were off to the best ride that America had to offer. 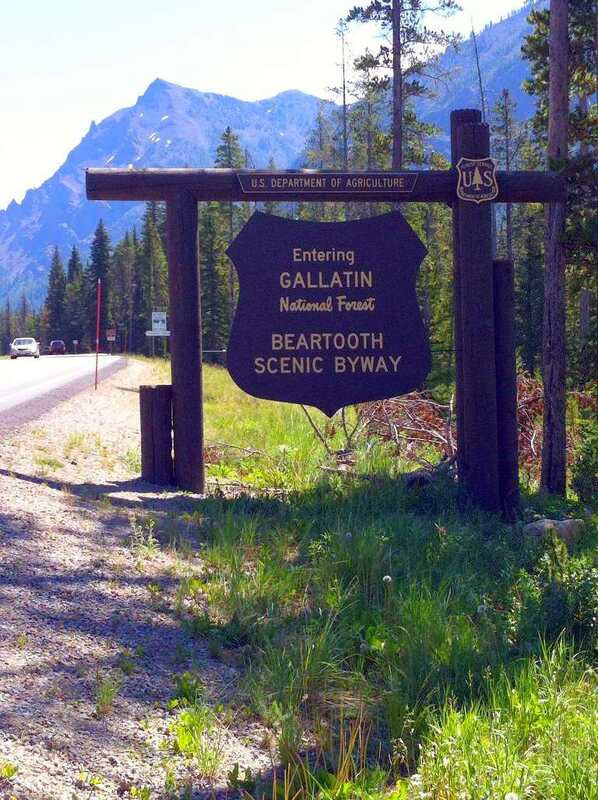 It was a beautiful day and I had visions of seeing forever as I lumbered along the Beartooth All -American Road. I knew The Turtle might cut off at any point on our eleven thousand feet elevation journey to Beartooth Pass. I was told that engines with carburetors didn’t get as much air as the newer engines that have fuel injection. And there I was practically floating on thin air. Several cars and motorcycles were heading that way too, so I figured they might help if something happened. The craggy mountains and v-shaped valleys were already breathtaking enough. Between sparse air, the sweeping views and my nervousness, I felt that Rocky Mountain high that John Denver sang about. The Turtle was doing fine. I was the one gasping and shaking. But it didn’t last long. As soon as I saw the plateau dotted with countless glacial lakes and alpine tundra, I knew the entire trip west was worth it. The Turtle and I made it over the highest elevation highway in the Northern Rockies. Our next destination was the wild side of Yellowstone National Park. I wondered what could be wilder than gaining 5,000 feet in less than a mile with four switchbacks in a turtle?